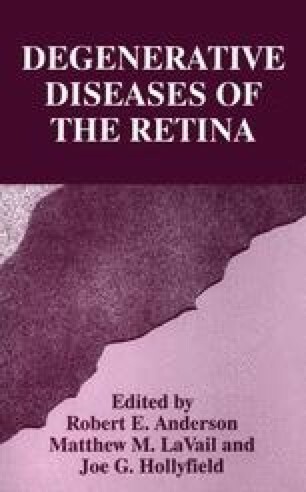 Retinitis pigmentosa is a heterogeneous group of progressive retinal degenerations sharing a common set of clinical characteristics comprising night blindness, constricted visual fields, pigment deposition in the outer retina and diminished or absent electroretinogram (ERG). It affects about 1 in 4000 of the general population and occurs as autosomal dominant, autosomal recessive, X-linked and sporadic forms (Heckenlively, 1988; Humphries et al., 1992). The proportion of the different forms of RP varies between populations. In addition to the above group of patients with isolated retinal degeneration there is a sizeable group in whom the retinal degeneration forms part of a genetic syndrome with non-ocular manifestations. In one study in the United Kingdom for example, the syndromal group formed 16% of index cases with RP (Bundey and Crews, 1984). The most common syndromal forms of RP are Usher’s syndrome and Bardet-Biedl syndrome, both of which are inherited as autosomal recessive disorders.